Winter Soups Stews and Chili warm the soul and nourish your body. Keep your family cozy in the cold winter months. I’ve chose 10 of our most popular winter soups, stews and chilis to share in our Winter soup Collection for you. Hearty Soups are is good healthy food. They are easy to make. And budget stretchers. All good reasons to love soup! Our current temperatures are in the teens and twenties with North East Winds and Snow is now DUMPING with no end in sight! In February no less. I’m stalling off shoveling the walk. I’d much rather talk to you about soup, stews and chili. Our Loaded Baked Potato Soup is sitting in the fridge right now. That hearty creamy rich soup is a perfect choice for snow work. We really love this soup and it makes great leftovers. It’s very sustaining soup! Warm cozy food is pretty much my game plan for the next couple of weeks. Which is how long this final winter blast is expected to last. How are things in your corner of the world? This Winter soup collection will bring you right to our heartiest soups stews and chilis. Good nourishing, sustaining food that will fill your belly. Beef stews, potato soup, tortellini soup, six gun chili and MORE wonderful easy home cooking recipes. It’s all right here in this wonderful collection. Come inside after a day of sledding, skiing or shoveling snow to one of these yummy dinners simmering on your stove, instant pot or crock pot. Any way you make them your family will love eating these cozy soups, stews and chili. Comfort food soup recipes are perfect for cold days. LOOKING for even MORE delicious SOUPS? Check out our soup section! Soups are one of my favorite things to make. I’m sure you’ll find many soups that your family will enjoy. One of the very best things I like about soups is they often use up leftovers. Only a few of these soups will send you to the store. Most of them use pantry items and leftovers. CrockPots are an Old Standby For Whipping up a pot of Soup. Many of the recipes in this collection are for crockpot soups. And several are instant pot soups. And remember if you can make it in your Crockpot you can use your instant pot on slow cook function too. A few of these recipe use a stock pot. The stock pot is best for cream based soups that are made quickly with the cream all in at the end. ANY of these winter soups can be made in a stock pot. But that’s not often the most convenient method. Why use the Instant pot for soups? The Instant Pot (here’s a good one) is the BEST for Soups, stews and chili using dried beans. The instant pot makes soups several ways. You can use the slow cooker function and treat it like a crockpot. OR you can use the soup function which is preset to cook up most soups in about a half hour. The Chili stew function and the meat/stew functions work well hearty heavy meat and beans soups. Invent your own soups and choose whichever method you want. Even the Manual function is often used by cooks for soup making. That Pot Is AMAZING. Get creative! Did you know dried beans are cooked in about 30 minutes in the instant pot? Dried beans are the ultimate budget stretchers. Any dried bean is FULL of protein, high in fiber AND they are very inexpensive. Not only is this an incredibly EASY recipe. It’s done in under two hours WITH dried beans. No Overnight soaking the beans or pre-cooking them for hours on the stove either. Nice! You’re sure to have at least some of these ingredients in your fridge. If your missing something I won’t be offended if you recreate a soup recipe and make it your own. Let us know what you do! Cream cheese, sweet potato, beef broth, black eyed peas, heavy cream and broccoli are all main ingredients for one or two of these soups. This collection has soups with ground beef, cabbage, sausage and even Tortellini. 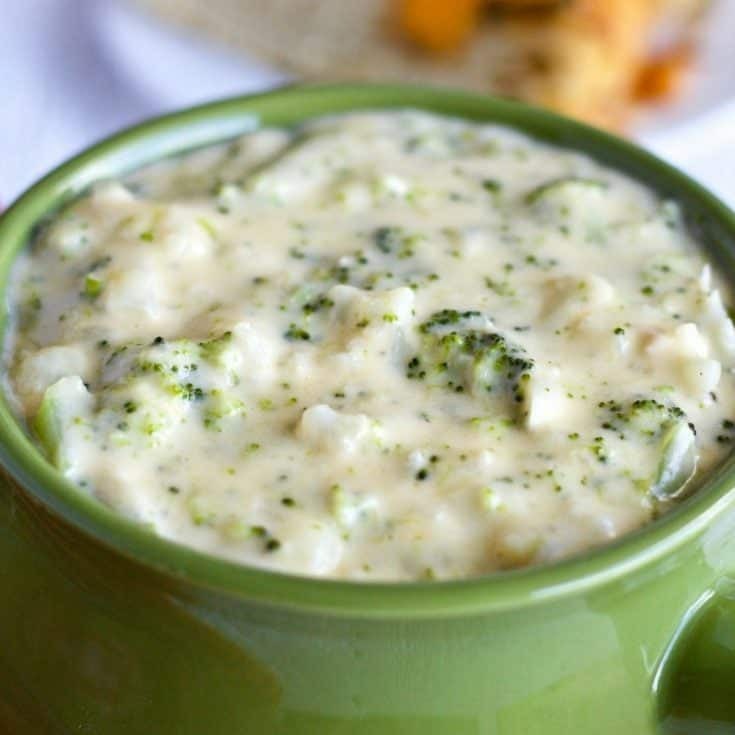 We even have a hearty vegetarian Broccoli Cream soup in this collection. Having a meatless Monday? You’ll love that soup! 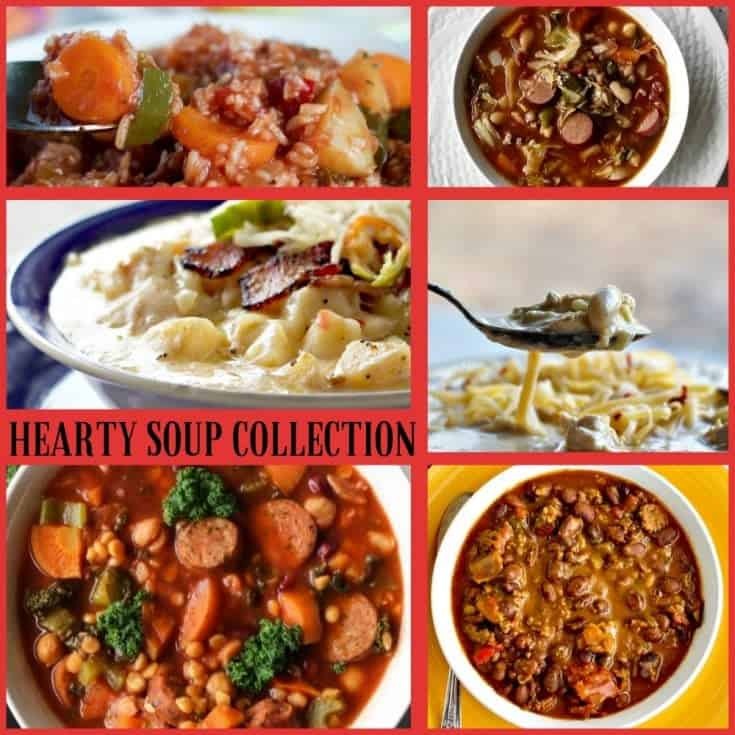 I’m pretty sure you’ll find soups, stews and chili for your family in this collection. Seven of our heartiest soups, stews and chili to keep your family warm this winter. 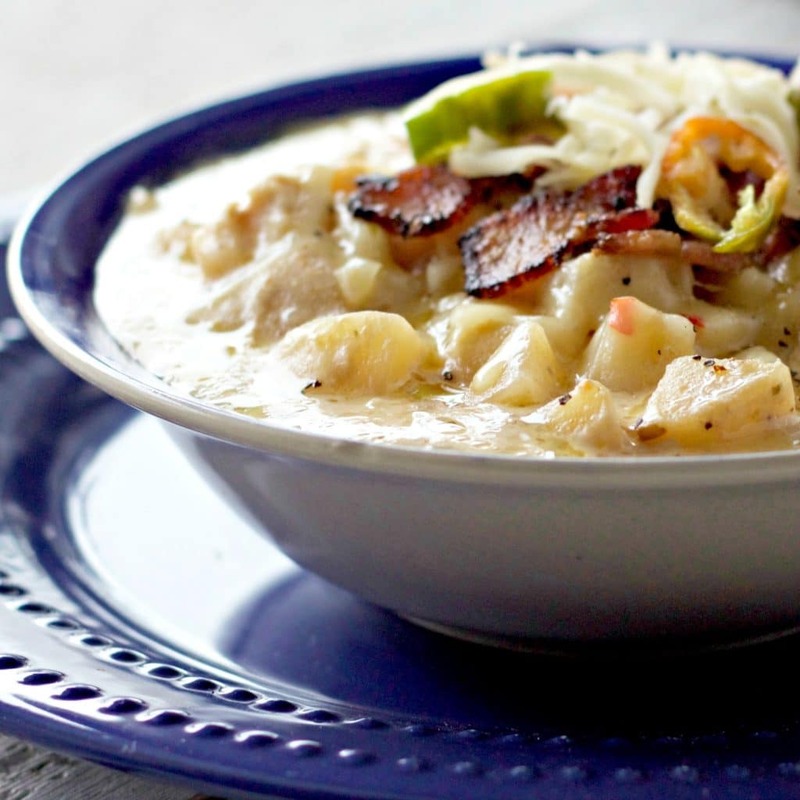 You'll find Potato soup, six gun chili, lentil soup, tortellini soup and even more great soups Ideas your family will Love! Check them out! 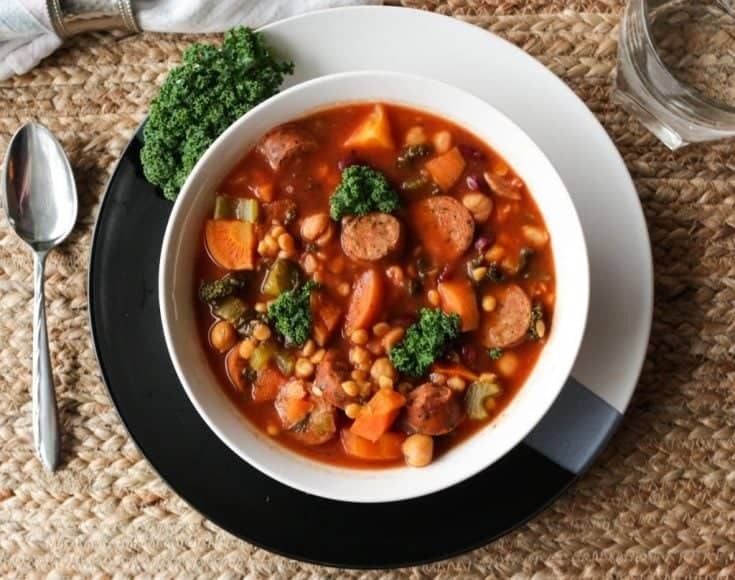 Lentil Soup with Sausage is a wonderfully healthy dinner made in a crock pot or instant pot. It's high-​fiber, low-​fat, dairy-​free, gluten-​free. This recipe makes dinner so easy. This healthy soup is nourishing, versatile and just takes 10 minutes to put together! Crock Pot Beef Stew with Rice is a hearty easy dinner for a busy day. Brimming with vegetables, beef and rice this Low-​Fat, Dairy-​Free, Gluten-​Free dinner is a family pleasing meal. Delicious CrockPot Tortellini soup with organic Kielbasa sausage, vegetables, kidney beans and cheesy tortellini noodles. Simmered all day in a flavorful tomato broth. An easy nutritious soup to warm up chilly nights. Gluten-Free, Beef Stew with cabbage is a bowl of tasty, healthy, deliciousness made easily in your crockpot. This dairy free cabbage soup recipe is high in Fiber, Low in Sodium and big on flavor! Hearty Crockpot Chili Chicken Soup is easy to make in your slow cooker or pressure cooker. This recipe is so delectable your entire family will be begging for more! Loaded Baked Potato Soup. Thick, rich, creamy deliciousness! So easy to make it in your crock pot or instant pot! An easy delicious, low carb meal ready in about 30 minutes. Rich creamy and cheesy. This filling soup makes a fantastic meatless meal. An easy way to make a meaty beef stew with dried beans. No soaking the beans! Instant pot magic! We’d LOVE to know which of these soups are your favorite. Please rate the recipes and comment for other readers in the comments below. And remember we are always here for you. If you need us or just want to give us personal feedback we’d love it. have a great day and enjoy your soup!